Is the DJ an artist? DJing is a relatively new phenomenon. Sure, DJs have existed on the radio for some time, playing song selections on the radio, or providing the soundtrack to weddings and fortieth birthday parties. However, mixing as an art form emerged in the late seventies, early eighties, when DJs such as Frankie Knuckles in America, started doing live edits to underground disco music, seaming tracks together to enhance the flow of the music and boost their party-hard audiences. This was initially done using tape machines. A pair of scissors and some cellotape and your wannabee jock could splice together songs. It was a rudimentary art form but it worked. Modern DJing was born out of this tape splicing when someone realised that the highend Technics 1200 turntable which had been around since the early seventies, had a pitch control unit which enabled DJs to manipulate songs further, and begin to actually beat match and mix them together. DJing was alive and disco and early house music provided the new soundtrack of a generation. Hip Hop jumped quickly on board and the workability of the Technics turntable meant a whole new form of skilled DJs cutting and scratching tracks. Bodypopping and breakdancing was all to the beat of the Technics turntable. I need not continue with the evolution of dance music. Suffice it to say, it has run hand in hand with innovation and technology. DJing became a career option. The problem is, as is very often the case with emerging sciences, how do you categorise a DJ? Are they musicians, artists, skilled, unskilled? Are they on the same level of employment in a nightclub as a barman or cloakroom attendant? Surely they are not creative as they just use other people’s artistic skills… Are they artists in their own right? Is a DJ on a par with a violinist or a concert pianist? When you are in the company of musicians and mention that you are a DJ, scorn is usually poured upon you. You aren’t fit to lace their boots – they are skilled, you are just an operator…. I beg to differ. DJs may use other people’s music for their art (though self-produced DJ tracks are becoming more common during a mixset). Using other people’s creative material is not a new phenomenon in the field of music. Take for example a concert pianist or violinist. Surely they often play symphonies by Beethoven or Mozart compositions. They didn’t necessarily create the material. They add part of their own character to a rendition of an already written piece of music, but they are not being completely original. 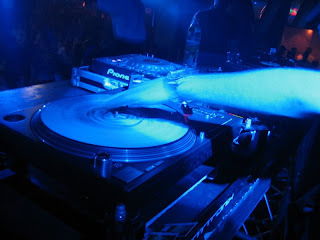 A DJ may play a record but by manipulating the pitch, by choosing when to cut it with another record, the DJ changes the song and adds part of his personality to the show. It takes skill to pluck a Cello’s strings, or stick to a complex rhythm pattern on a set of drums, but DJing has its own set of skills. Scratching, beat matching, cutting and chopping, pitch blending all form part of a successful DJ’s repertoire. To me the most skilful part of being a DJ isn’t the ’manual skills’ as I refer to them but the ‘mental skills’. A good DJ is not averse to a bit of brainwork and to me set programming is fundamental. A skilled DJ programs his set, his tune selection, with the utmost precision. Each track should follow musically into the next, the music program should be interesting, challenging, entertaining, seamless. It should take the listener on an auditory journey. The difference between a good and bad DJ set very often lies in the set programming. The set of technical skills varies very little between performance DJs. The wheat is separated from the chaff by the occult skills of planning and sequencing tracks. Consider another form of art. Photography is a relatively new phenomenon in the field of visual art. It involves a new technology. However, photographers are similar to painters. It involves a different set of technical skills to use a camera successfully. But in using his tools a photographer chooses a maybe otherwise dull scene to shoot, capturing the art he sees in that image in the camera lense. He presents the image in a way to portray his feelings, his emotions, his perception of the world. Nowadays, photography is widely accepted as a professional art form and indeed a prosperous career. I think that DJing is certainly more acceptable these days. Musicians recognise the need for good DJ talent to perhaps compliment their work. DJs such as Paul Oakenfold were touring with U2 and the Happy Mondays back in the early Nineties. We are seeing today independent DJ artists like Mark Ronson or Sasha emerge in their own right as pop stars / music performers. DJing is the photography of the music world. It is an art form. Often misunderstood it is part of a DJ’s role to define what it is to be a DJ, to be an artist, to be a musician. We should revel in our new science. Our artistic legacy inspires tomorrow’s musicians. New technologies make DJing one of the most evolving forms of music. It has never been a more exciting time to be a DJ. We are tomorrow’s musical artists.